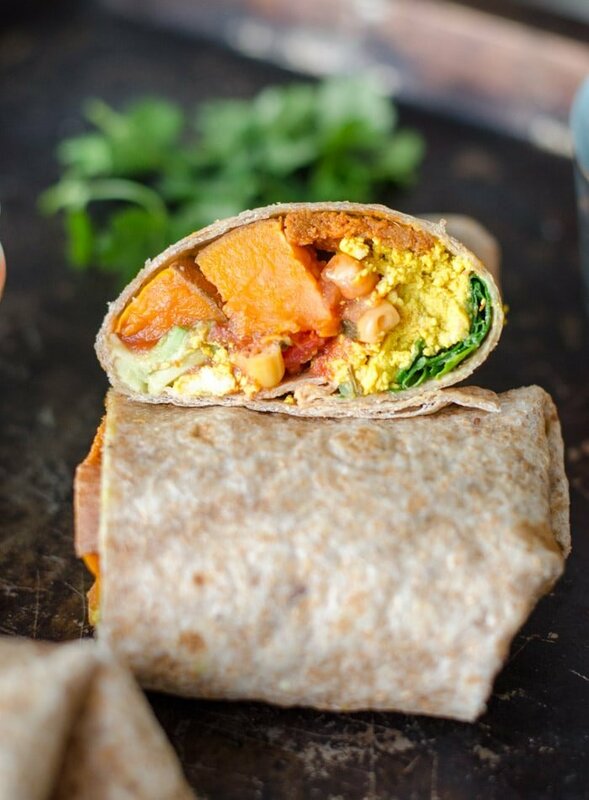 These vegan sweet potato breakfast burritos can be prepared ahead of time and make a healthy and satisfying vegan breakfast option. 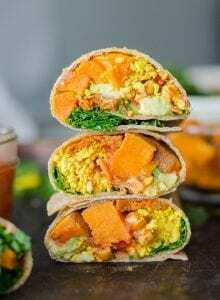 They’re filled with sweet potato, tofu scramble, kale, vegan sausage and avocado but you can easily change it up to include things like salsa, vegan cheese, black beans, spinach or refried beans. Don’t feel like a burrito? 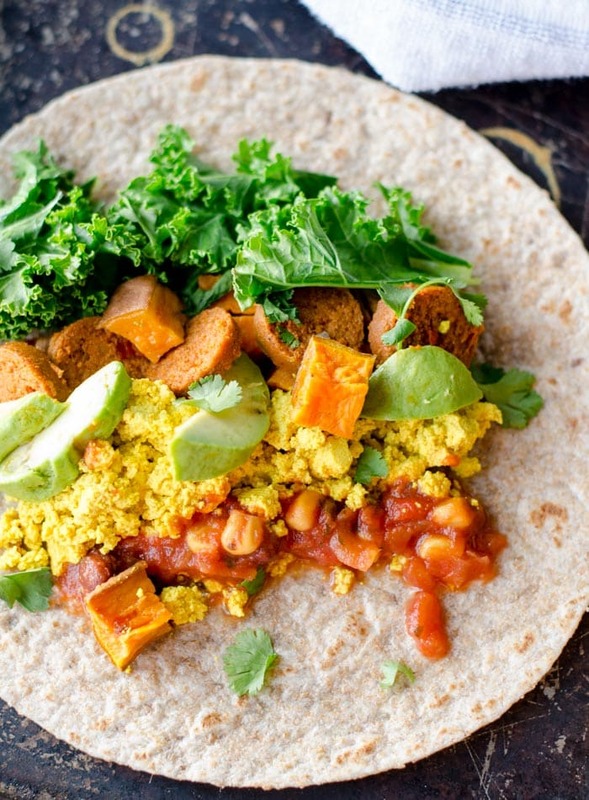 Try them as sweet potato breakfast tacos or just throw everything in a bowl and dig in. I don’t buy these too often but they are really good and nice to have on occasion. The Mexican Chipotle one is delicious and the Apple Sage one is really good too. They actually have an Apple Maple Breakfast Sausage that sounds like it would be really good in this too but I’ve never tried that one. I’m in Canada and I can always find the Mexican Chipotle and Apple Sage in my local grocery store. If you can’t find Field Roast, you can leave it out and add something like black beans or a veggie burger or try another brand such as Tofurky. 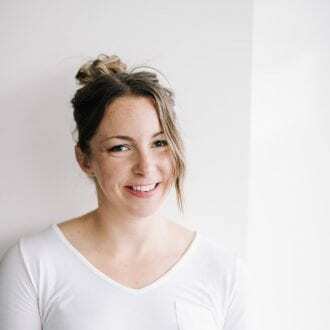 Field Roast makes their sausage from vital wheat gluten so they’re soy-free and high in protein however they do contain gluten. 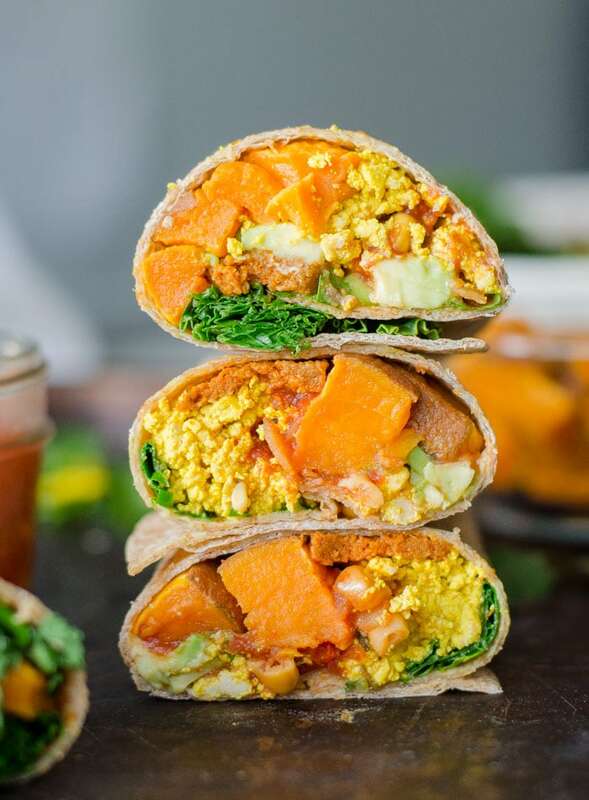 To make these burritos, pop the sweet potato in the oven and while they cook, prep the tofu and kale. 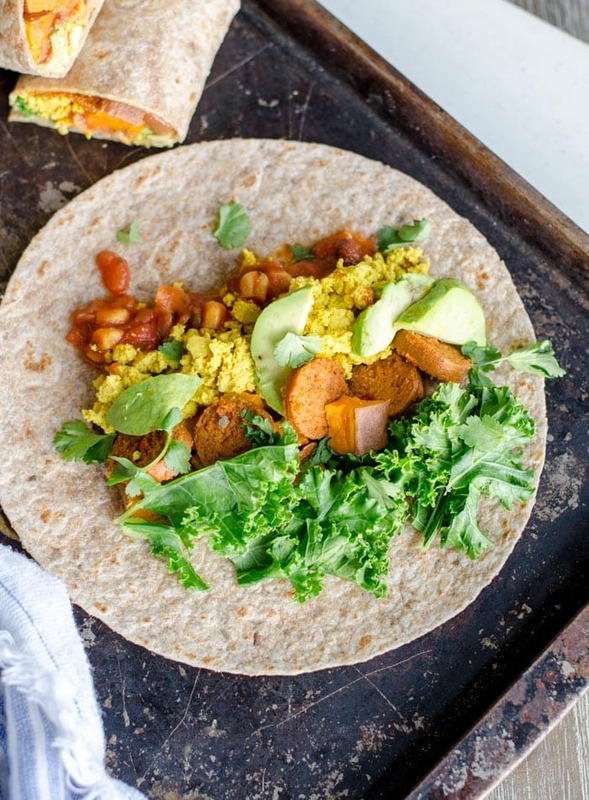 Once everything is ready either toss it all in a bowl or roll it up in your favourite tortilla and enjoy. To Make the Roasted Sweet Potato. Pre-heat the oven to 425 degrees. 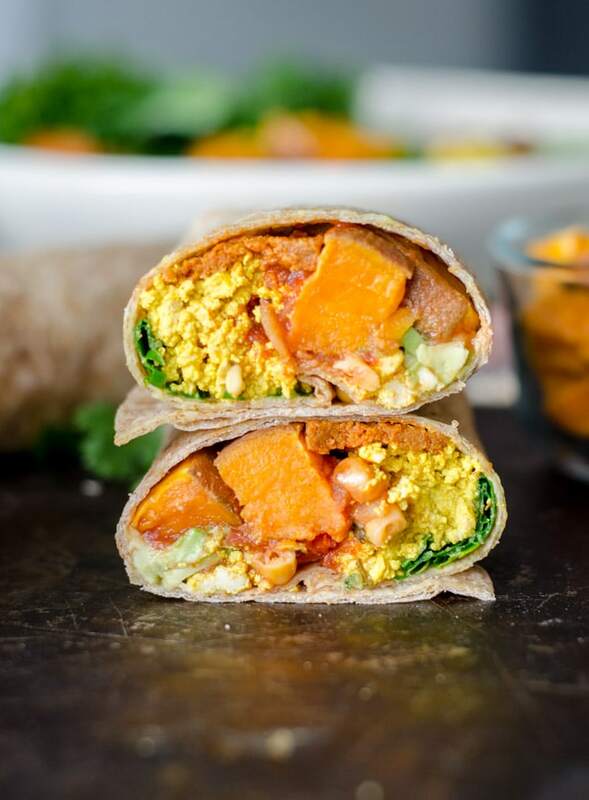 Dice the sweet potato and place it on a parchment paper or silicone mat-lined baking sheet. Drizzle with a little olive oil and roast until tender, approximately 30-40 minutes. Season with salt and pepper and any other desired spices. To Make the Tofu Scramble. Crumble the tofu into a pan then add the rest of the ingredients and cook until the water is gone. To Make the Kale. Tear or chop the kale leaves away from the stems, finely chop then add to a pan and either saute in some water or olive oil until softened. Don’t overcook. You just want it slightly softened and a nice, dark green colour. To Assemble the Burritos. 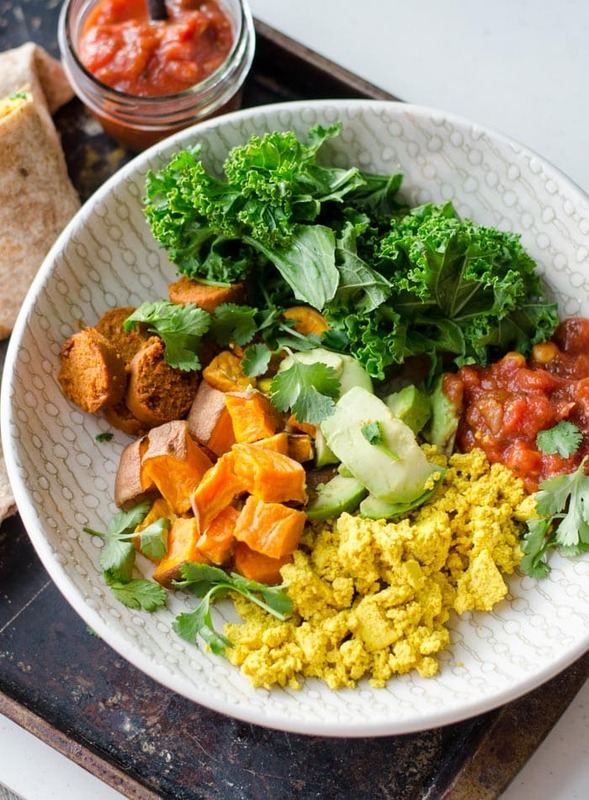 Add some roasted sweet potato, tofu scramble, kale, avocado and 1/2 a sliced vegan sausage to a tortilla and if desired salsa and/or vegan sour cream. Fold in two sides then roll it up to create a burrito. Either server immediately or wrap in foil and store in the fridge to be reheated later. Yum! This looks like the perfect breakfast for a weekend morning. I decided to have this for lunch today, it was delicious. I make a couple of changes though (as I usually do), since it was my first time eating kale I did a bit research (a quick one) online before and apparently it is not a very good idea to eat raw kale so I cooked it with my scrambled tofu to which i also added onion, garlic and some tomatoes. I skipped the sausage but added some alfalfa sprouts (just because I had it), also new for me. Overall I enjoyed every bite. Cool, sounds great with sprouts! So glad you enjoyed it. 🙂 Thanks for your comment! Any tips on storing these if I prep them at the beginning of the week? 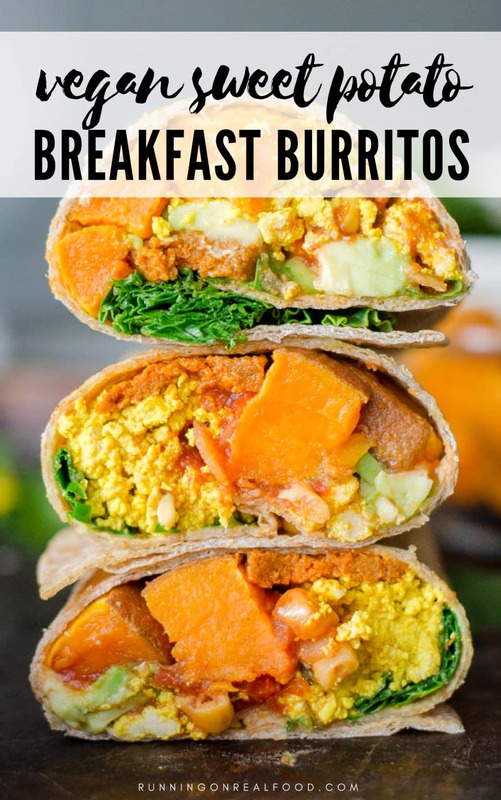 Most breakfast burritos require freezing and re-heating in the microwave but I dont have access to a microwave so I was wondering if I could make these and just keep them in the fridge for the week. Will they keep for that long just in the fridge? They might get a little soggy. I would recommend storing the ingredients separately in the fridge and then preparing as needed each day. Mix up the scramble, sausage and sweet potato and that will keep in a container for up to 5 days, then add to your tortilla each day.